For three days I have struggled to write a fitting tribute to Keith Emerson. All I could muster was his name, staring starkly back at me from my unrelenting computer screen. As I watched the outpouring of sentiments, articles, and remembrances stream by on social media from all over the world, I gradually began to recognize that my connection to Keith differed from the legions of devoted fans, friends, and admirers who have been so deeply affected by his passing. 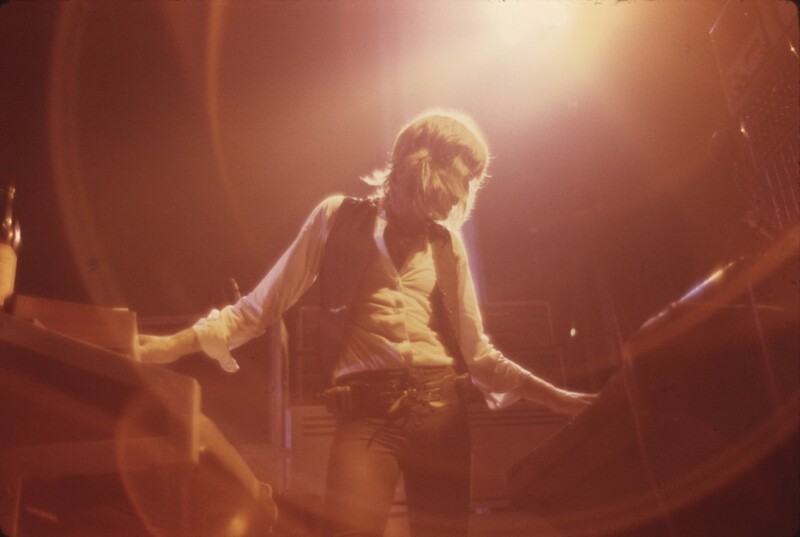 As I was only a small child in ELPs heyday, I never attended one of their concerts, I didnt know his music as well as many others, and I wasnt as close to him as people who knew him for decades. Yet the bond between us is at once titanic and ethereal. And herein lies the weight of writing about Keith Emersons passing. My connection to him, our connection, is multifaceted, rooted in his musical relationship to my father and in my personal and professional bond to my father and his powerful legacy. When asked on several occasions by interviewers if my father were a musician, he would firmly reply no, that he was a toolmaker, and I make tools for musicians. This was an inherent acknowledgement that his technological creations were but silent machines unless musicians released their vast capabilities to the listener. The best musicians, starting with experimental jazz composer Herb Deutsch, astonished him with their pioneering efforts to weave early modular synthesizers into their music. 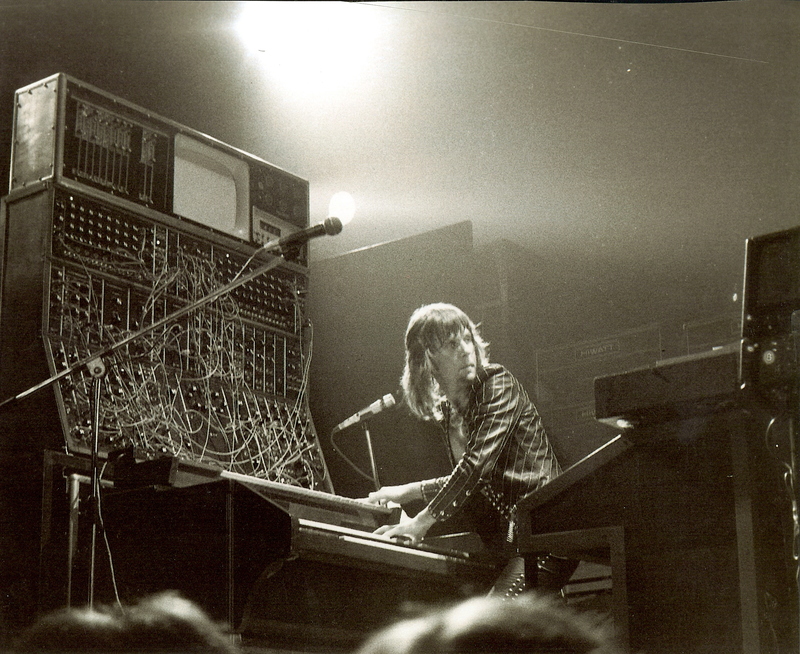 Although Wendy Carlos was the first to bring the vastly expressive but technically complex Moog modular synthesizer to the popular consciousness (thanks to her musical prowess and painstaking technical achievements), it was Keith Emerson who dared to not only perform live with the instrument in front of tens of thousands of people each night, but to do so while using it as a featured voice. Keith pioneered the use of the Moog modular in a live rock context while fearlessly bringing it and other electronic keyboards to the fore of the genre. In interviews and in my conversations with him, Keith spoke of his concerns when acquiring his original Moog modular. It was expensive, and he hadnt a clue how to use it. Back in those days, it didnt come with much instruction, and when he received it, he couldnt get it to make a sound. But tapping into his inspiration of nearly a year earlier when first hearing Switched-On Bach and heeding his inner visionary, he embarked on a quest to master the instrument and harness its sonic power to expand the worlds musical experience. Keith boldly used his unique position as a rock star musician to forge new sonic pathways for us all. He mounted a formidably powerful spaceship and explored the aural universe in a way that took tremendous courage, talent, and resources. As we all know, Keith went on to take the Moog modular synthesizer to astounding heights, both as a sound and a stage presence. As his use of the instrument grew, so did his connection to its creator. Keith and my father shared a 35-year friendship in which they delighted in their deep and symbiotic partnership that helped bring musical expression to new heights. They shared much in common as Keith explored new developments in Moog instruments and Dad reveled in Keiths unique capacity to use the Moog sound in continuously creative ways. They were the ultimate geek and rock star pair. Beyond their musical partnership, they were friends with a kindred sense of humor, one in which they reveled each time they saw each other. They were truly significant to each others lives, intrinsically intertwined for eternity in their quest for and dedication to higher musical expression. Keiths connection to Bob Moogs legacy is so vital that his passing has affected me more than anything since my fathers passing over 10 years ago. The sense of loss is vast. His absence brings with it a sense of irreplaceability and impermanence. Regardless of contemporary musical visionaries, the impact of Keiths work and of his audacious harnessing of unknown possibilities will never be duplicated. 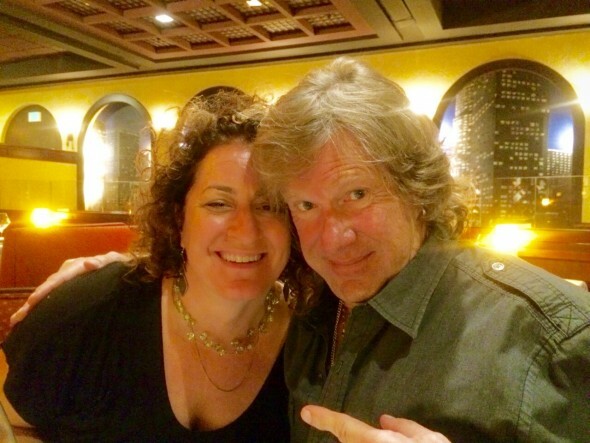 Keith Emerson was more than his music. He was more than massive modular synthesizers, knives in organs, incomparable keyboard technique, savant-level musicianship, and spinning pianos. 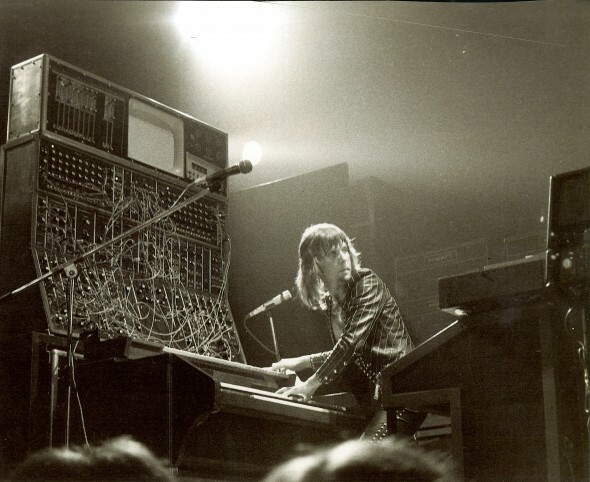 Keith Emerson was a fearless, revolutionary visionary who used technology and the transcendental language of music to demonstrate for all of us that surmounting monumental challenges could reap rewards of cosmic proportion. And that is how I shall remember him. Thank you Michelle for these wonderful words. Not only remembering Keith Emerson, but also you father. Thank you Michelle for putting into words what I have been struggling with for the last few days. No further words are required – just simply “Remember”…..
Michelle, one of the best (and accurate) remembrances I have read yet. Beautiful. Beautiful tribute Michelle, to someone we all considered family. I’ve told him that myself on many occasions. Truly devastated by his passing, but even though we’ve lost the man, we have not lost his music and it is there that he will reside with me forever. Love and hugs! An absolutely beautiful tribute to a synth legend by the only one who could make such a statement.. Thank you so much Michelle, you have eased my soul. Thank you for this. Keith and your dad had a major influence on so many people that you will never know. Like many, I am still processing the news about Keith. Your piece here brings us all closer together. Yes, we are all family. So happy for all the times I got to see Keith perform. So sad that he felt he could no longer deliver. He already delivered. And for me, he continues to deliver with new and renewed connections that have come about because of the news. The show will never end. THANK YOU Michelle. By far the best, most moving and accurate tribute to the man, his talents, and the wonderful relationship he had with your father, also a legend. Lovely to read and see the photos. Thank you Michelle, for those wonderful words…! Sharing tears with you and the countless BMF followers. Thank you for the poignant and moving reflection on Keith and your dad and your relationship with them both. Keep up your good work. I am so proud of you! Thank you, Michelle, for such a beautiful and poignant post. I was at that NAMM show pictured, where your father jammed with Keith. In fact, I had the ultimate luck and joy to be a small part of that experience; my friend Rik Pepe had connections with Will Alexander, Keith’s roadie/tech at the time. In exchange for pre-show access, we were recruited to help with the setup and sound check. 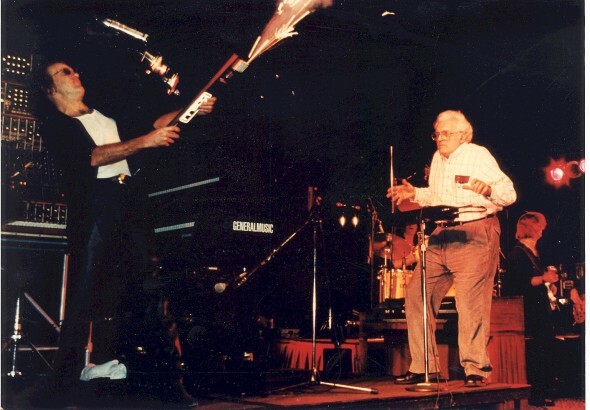 At some point, it became an issue that someone had to run over to the Moog booth and pick up that very theremin – the one that Bob is playing in that picture. I jumped at the chance, and with the proper permissions (“Who sent you? Keith did!”) I picked up the device and brought it back to the stage where it was tested and ready to go in the evening. I was sitting in almost the exact spot where that picture was taken (it could have been ME, but I can’t claim ownership – maybe it was from Rik Pepe?) In any case, I thought my heart would explode for sheer joy from the moment Bob walked out and started “Jamming” with Keith during AquaTarkus. It was perhaps one of the hands-down coolest things I had ever witnessed, and I was right up in front as well. After the show, there were even “groupies” that wanted to meet him – as such – this was a trade show, remember! – but your Dad and Keith took it all in good humored stride. Bob was awestruck at it all – and quite a bit amused – that he was being treated with such admiration and star-power. I OF COURSE got Bob’s autograph and related that I’d picked up the theremin earlier in the day. Soon enough, Bob, Keith and everyone else took off for a meet and greet somewhere, but I’d had the time of my life; witnessing two of my biggest (still to this day!) heroes. Shook both their hands once more, and walked away, floating on air. I was at that1973 concert at Rich Stadium (now Ralph Wilson Stadium). I was a goofy 18 year old. . .ELP ROCKED the house! I always wondered about the Moog connection because back in the 1960’s I had an uncle who worked for Moog (in Western New York). I was not sure if the Moog Synthesizer was connected with THAT PARTICULAR Moog. All I remember is that it was a great place to work back in the day. Michelle this was very touching. I had the pleasure of meeting both Keith and your dad when ELP came to Madison Sq Garden Dec 17-18 1973. I last met Keith on Mar 5 2010. Your father created a monster and his name was Keith Emerson the master of the keyboards. I would lovingly call his modular Moog the monster. A beautiful tribute Michelle. Thank you so much for sharing your thoughts and feelings about Keith and of course your father.Two pioneers in modern music and technology that changed the world! Fantastic written piece… and very much appreciated. On one hand, it is a sort of resurrection of the impact and importance of keith’s working now coming through. As always with great masters, to late when they are not here anymore…..
on the other hand, this disbelief and inability to grasp it. How come, like in my case being a non-musician, we’re people all over, all walks of life, being not only affected by him, but also unusually bonded by him ? Again, really great and heartfelt message ! Great words to a great artist. I was lucky to meet your father at a John Eaton concert at the University of Chicago, Michelle. I pressed a copy of my cassette “Pink Sounds From The Purple Plain” into his hand and said, “I made this on my MemoryMoog, I hope you enjoy it”. Keith Emerson was my musical hero and he will be missed. I hope the world remembers him as a great composer. His music, and the Moog legacy live on. Thank you for writing this, Michelle. I know it wasn’t easy. Much love. A beautifully expressed tribute to two amazing trail blazers. Never had the pleasure of meeting Bob or Keith, but their respective works touched my life (and bank account 😉 on so many levels. Thanks for this moving tribute. Thank you for such a poignant tribute to both Keith and your father, both brave visionaries with kind hearts. They are missed. This gave me the chills. Beautifully expressed. Thank you for sharing your thoughts with us. Thank you so much Michelle. This exquisitely beautiful and heartfelt tribute helps all of us as we struggle with the loss, yet celebrate the transcendent effect Keith…and your father had on us. I’ve told you this before but it bears repeating: I too was at the pictured NAMM show where Bob got up onstage with Keith–and it was only BECAUSE of Bob that I got to witness this magical moment. I met Bob for the first time earlier in the day (I could hardly believe I was talking to Bob Moog!) and the subject of Keith came up. With a twinkle in his eye he told me that Keith was playing a show that evening and asked if I’d be interested. He directed where to go to get a ticket and said “Tell them Bob sent you.” Out of the blue to a complete stranger, this act of generosity floored me. When I saw Bob play the theremin onstage with Keith that night I was beside myself. As soon as he raised his hands to the theremin he lit up and became a man possessed! The connection and joy that he and Keith shared was unforgettable. After the show I persevered through several denials by roadies and got to go backstage and met Keith for the first time. The whole thing seemed like a dream. But it was real..because of Bob. But of course, making dreams a reality is what Bob did. Thank you Bob. Thank you Keith for the incalculable inspiration and fierce artistry. And thank you Michelle. Michelle, thank you for such a beautiful, eloquent and heartfelt tribute. You’ve successfully articulated exactly why so many of us feel such an acute sense of loss. Keith was truly a unique artist and the world is immeasurably poorer for his loss. He and your late father certainly made for a formidable combination; the course of modern music would have been very different without your father’s wonderful invention and Keith’s absolute mastery of the instrument. The one consolation is that Keith’s influence and extraordinary body of recorded work will live on long into the future. Truly awesome words Michelle, I had the pleasure of meeting Keith once and sharing a drink with him, he was generous with his time as well as his advice. 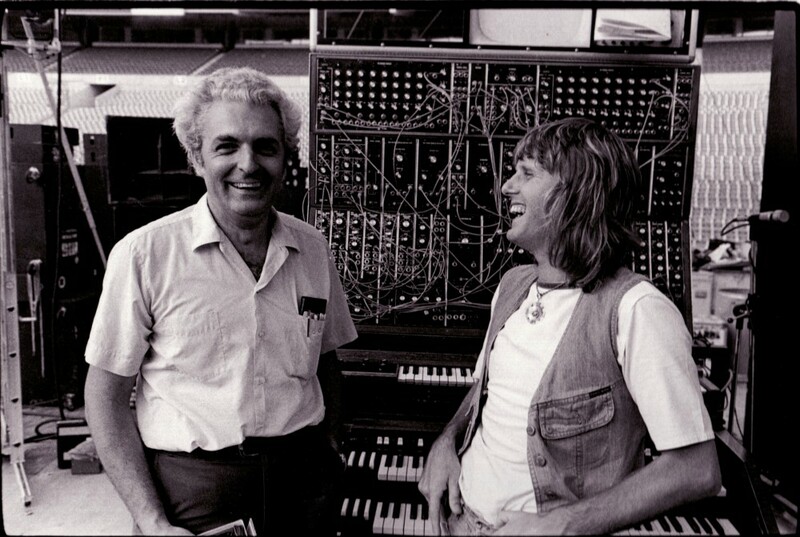 Never to be forgotten – Bob Moog and Keith Emerson making the music revolution. Thank you, Michelle, for a beautifully detailed, warm and touching piece. Needless to say, Keith was the god of the Rock expanding synthesis world of the late 60’s, 70’s and well into the 80’s. As a university teacher of contemporary music history, he was and remains a primary developer of our music today. When we met only too briefly in 2014, I had the wonderful experience of talking with him at length, talking about piano and composition and about his place within my small world of Music Education and History. Your words and those of so many others tell it all!! Beautifully written. A wonderful testament to an amazing relationship that changed the world of music forever. Thank you very much Michelle for sharing this. We all miss him already. Michelle, so eloquent and well-stated. Thank you for writing this beautiful tribute to our hero Keith Emerson. Wonderful tribute. I love how you described what a lot of Keith’s electronic music was really about and how it unified people. I would like to share my personal connection to your father & Keith E.
i’m hobbyist bought my 1st Rompler workstation 10yrs ago & learned Music Theory…. thank you for sharing your personal photos and your connection on paper for all of us to savor……. From New Zealand so far away from the chaos and disbelief there are tears of respect. A well written tribute and God’s speed. Thank you Michelle. I too have long been a Moog fan and an Emerson fan since I was about 10. I remember asking my big sister to take me to see ELP when they played in my hometown in about 1972. My sister thought I wasn’t serious since “kids don’t go to those kind of shows”. It was a real bummer for me. I went to the Museum of Making Music about 6 years ago and saw Keith’s monster Moog, and also many other Moog instruments. They all thrilled me. I don’t play (well, not very well) and have utmost respect for those musicians who also are gifted with technological innovation. Emerson was the whole package. He was unafraid to see what this unique instrument could do, and was constantly inventing new voices for the synthesizers. My keyboard at home is a little old thing with a lot of presents. About 30 of the presents are Emerson’s various keyboard voices. Your words in this memorial moved me deeply. Kieth was a fixture in my musical world, and his work cannot be separated from your dad’s work. You have eloquently expressed that intriguing relationship. Eloquent expression of your thoughts Michelle. Thank you. A wonderful and moving tribute. This music and this innovative technology has shaped my musical imagination and I am very grateful to your father and to Keith. Thank you for sharing this. Thank you Michelle, for sharing your wonderful thoughts and memories of your wonderful Family. Lovely tribute to Mr. Emerson, a man who gave us so much, and touched us so deeply with his wonderful exuberant music. And there was always that connection to papa Moog’s machines, the “voice” of the gods that Keith so completely tapped into. I so wish he could have enjoyed his golden years, letting go what was no more and reminiscing over all that magic he created over the years. He certainly deserved it. In the late 80’s I wrote a letter to the editor of Keyboard, bitching about how the Japanese were eating our lunch in the keyboard wars, and advocating for some patriotic nationalism in our buying habits. I was surprised to see Bob Moog’s rebuttal the next month, basically saying “Nay nay, the Japanese were innovating, and the American keyboard companies had rested on laurels…” It was a brave and honest evaluation, and coming from anyone else, I likely would not have accepted the message. Your dad was the real deal, a true mensch. There are a handful of people who have markedly influenced me, having been born in the 60s, I literally grew up with Keith’s music and without him and a very few others, I’d never have started playing keyboards or dabbling with a synth for the first time in 1975 as a wee lad in SoCal. Inspirational is the simplest, yet far inferior word for his impact on me. He will be missed, but always remembered. Michelle understood Keith better than most people. And she truly understands how he was much more than a keyboard player or musician to me.